Cattails are a perennial and a common marsh plant. 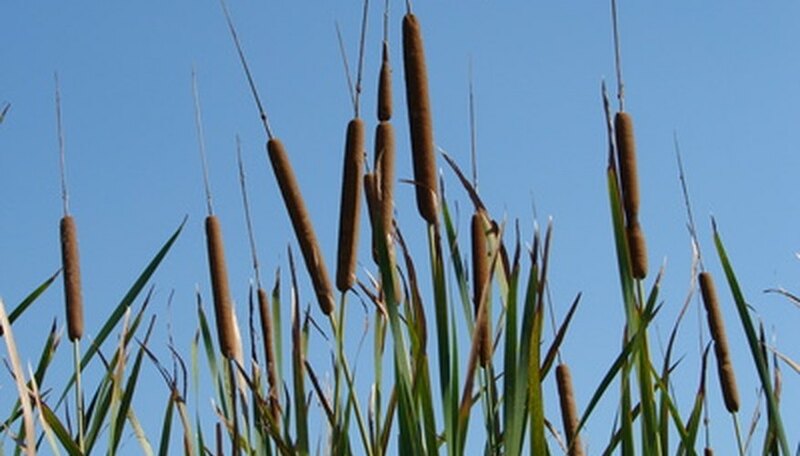 They're easily recognizable by their long, thin leaves and distinctive cattail tops, which are brown fuzzy cylinders six to 12 inches in length. The cattail goes through four distinct stages in its life cycle. Throughout the winter and into early spring, cattails exist mostly as rhizomes, which are tuber-like root parts that live underground. Cattails reproduce by growing and spreading rhizomes through the summer. If you want to plant or re-plant cattails, dig rhizomes in early spring, before they have begun to put out new shoots. In early to mid-spring, cattails begin to grow new leaves. The long, flat leaves resemble daffodil or iris leaves, and may be mistaken for them in the early stages of growth. Cattail leaves soon become distinctive, however, by their length, growing anywhere from three to nine feet long. Although rhizomes can still be transplanted once young shoots have appeared, they stand a better chance of survival in their new home if transplanted before the young shoots appear. Cattails are hermaphroditic, meaning that the male and female plant parts grow on the same plant. On a cattail, they also grow on the same stalk. During summer flowering season, a cattail puts out a female flower part, which is a brown fuzzy cylinder about six to 12 inches long and about an inch in diameter. Immediately above the fuzzy cattail, the plant grows a three- to six-inch stalk covered in tiny brown flowerets. This is the male part of the plant. During the reproductive season in mid-summer, the male parts shed large amounts of golden pollen. Eventually, the flowerets dry up and fall off. A cattail plant has lost most of the tiny flowerets by mid- to late summer. As the male flowerets die off, the female part of the cattail begins to produce seeds, each of which is connected to a bit of white fluff to allow it to travel more easily on the wind. Cattails produce seeds in late summer and early fall. A single cattail plant may produce as many as 250,000 seeds in a season. The seeds are popular food for a number of migrating marsh birds, including blackbirds. Although it is possible to start cattail plants from seed, it is considerably easier to start them from rhizomes. If planting seeds, plant in early spring, after the ground has thawed. In late fall and winter, the cattail's leaves and flowers die off, although they frequently remain standing in swamps and marshy areas. The cattail hibernates in its rhizome throughout the winter. The best time to dig rhizomes is after the plant has died off and before the ground freezes in winter, or after it thaws in early spring. Rhizomes dug in winter can be stored until spring. Place rhizomes in a paper bag and store in a moderately cool, stable temperature such as in a basement or pantry.